We are so excited to see so many awesome entries for our March challenge. Thank you for sharing your amazing designs with us. Choosing a winner was a most difficult task! We loved the mix of watercolors on this gorgeous flower with the added dimension of the popped up blossoms. 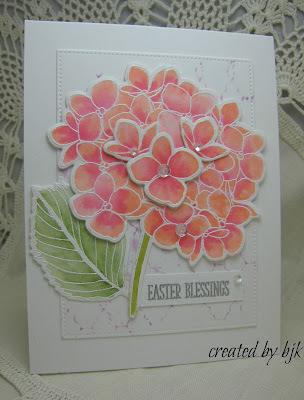 The bit of subtle texture behind the flower and a few sequins make this card extra special. All this and Betty's card is still very CAS! Make sure to grab the winner's badge below. Congrats to Betty and all those mentioned so many lovely designs! can't wait to see the April challenge! Congratulations to the winner and the Outstanding Entries! And congratulations to you both, Loll and Bonnie, for a very successful start! 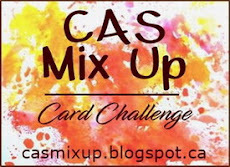 155 entries at your first challenge - woohoo! Congrats to the winners, what beautiful cards! Congrats to the winners! I'm afraid my good intentions of joining in came to nothing! Promise I'll try harder next month. Congrats to Betty on her well deserved win, and to all who received mention for their gorgeous submissions! Thank you so much for selecting my card among the outstanding entries, as well! I'm looking forward to playing along again!!! Congrats to all, lovely projects showcased here. Fabulous picks!! Congratulations to all the winners, your cards are beautiful. I can't wait for the next challenge, thank you Bonnie and Loll!!! Congratulations, Betty - your card is beautiful. And congrats to all the outstanding entry people! Thank you for featuring my card alongside all these beauties and congratulations on a such a successful kick off to you cool challenge. Beautiful! What a bunch of fan-tab-ulous cards! I am so excited that my card finds a place amongst so many beautiful creations! Congrats Betty, for the super awesome card. And thanks Bonnie & Loll for honouring me with an Out-standing Entry!